Senator John Sidney McCain III was born on 29 August 1936 at Coco Solo Air Base, Panama Canal Zone.1 He was the son of Admiral John Sidney McCain Jr. and Roberta Wright.1 Senator John Sidney McCain III married Cindy Lou Hensley on 17 May 1980 at Arizona Biltmore, Phoenix, Maricopa Co., AZ. 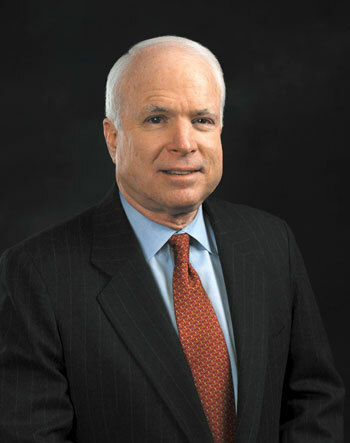 Senator John Sidney McCain III died on 25 August 2018 at Cornville, Yavapai Co., AZ, at age 81. He was buried on 2 September 2018 at Naval Academy, Anne Arundel Co., MD. In his book Senator McCain quoted his grandfather speaking to his own son in Tokyo Harbor during the surrender of the Japaneese: "Son, there is no greater thing than to die . . . for the country and principles that you believe in." The senator then reflected that he had served a purpose greater than his own pleasure or advantage. And for that, sir we are all greatful.